completion. Lines linking the boxes are called connectors. The general direction of flow is evident in the connectors themselves. 3. Critical activities - Activities that, together, comprise the longest path through the network. This is represented by a heavy- or hash-marked line. The activities are logically sequenced to show the activity flow for the project. The activity flow can be determined by answering the following questions: What activities must precede the activity being examined? What activities can be concurrent with this activity? What activities must follow this activity? WORKING ACTIVITIES. - With respect to a given activity, these representations indicate points in time for the associated activities. Although the boxes in the precedence diagram represent activities, they do not represent time and, therefore, are not normally drawn to scale. They only reflect the logical sequence of events. MILESTONE EVENTS. - The network may also contain certain precise, definable points in time, called events. Examples of events are the start and finish of the project as a whole. Events have no duration and are represented by oval boxes in a network, as shown in figure 9-8. Milestones are intermediate goals within a network. For instance, "ready for print" is an important event that represents a point in time but has no time duration of its own. To reach this particular activity, all activities leading up to it must be completed. CRITICAL ACTIVITIES. - A critical activity is an activity within the network that has zero float time. The critical activities of a network make up the longest path through the network (critical path) that controls the project finish date. Slashes drawn through an activity connector, as shown in figure 9-9, denote a critical path. Figure 9-9. - Designations of a critical path. The rule governing the drawing of a network is that the start of an activity must be linked to the ends of all completed activities before that start may take place. Activities taking place at the same time are not linked in any way. In figure 9-8, both Activity 2 and Activity 3 start as soon as Activity 1 is complete. Activity 4 requires the completion of both Activities 2 and 3 before it may start. 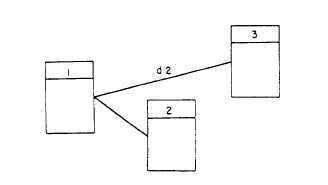 Within a precedence diagram, connectors are lines drawn between two or more activities to establish logic sequence. In the next paragraphs, we will look at the diagram connectors commonly used in the NCFs. REPRESENTING A DELAY. - In certain cases, there may be a delay between the start of one activity and the start of another. In this case, the delay maybe indicated on the connector itself, preceded by the letter d as in figure 9-10. Here, Activity 2 may start as soon as Activity 1 is complete, but Activity 3 must wait 2 days. The delay is stated in the basic time units of the project, so the word "days" can be omitted. Figure 9-10. - Representation of delay.